More than a dozen community members turned out Tuesday evening to support a proposal from Laundré, the white-walled laundromat-cafe on 20th and Mission, to add beer and wine to its menu. None of the community members in attendance could think of any potential problems with the establishment selling beer and wine until closing time at 10 p.m. Still, the owner and her supporters fear that opposition is lying in wait. Just hours before the public meeting, seven members of the neighborhood coalition United To Save the Mission — including Peter Papadopoulos, a Mission Economic Development Agency employee — met privately with Laundré’s owner, Ariana Roviello, her partner Peter Smith, and their permit expediter, Mark Rennie. Larisa Petroncelli, co-owner of Factory 1 Design, and Erick Arguello of Calle 24 were also present at the meeting, representing the coalition. At that meeting, the coalition laid out several requirements Laundré needs to fulfill to gain its cooperation. Roviello said the meeting was intimidating, an hour-long “roast” focused on what was wrong with her business: its lack of Spanish-language signage in the cafe area and the overall decor — especially the white paint (more on that later). Roviello said the group tried to convince her not to pursue the license until an agreement was reached. When the coalition referred to a memorandum of understanding (MOU) that Roviello would need to sign, her three-member team signaled an unwillingness to put pen to paper. They requested time to carefully review the terms of the document. “That’s when things got frazzled,” she said. When Roviello then asked for the MOU’s specifics, Papadopoulos refused to show it to her and said, “‘It’s what we’ve discussed and a couple other things,’” Roviello remembers him saying. When she asked what the “other things” were, he declined to tell her, she said. He said he and other members did not leave the MOU because it was only a sample and that he never intended for Roviello to sign the MOU that day. “We thought of its potential to be intimidating, to seem like a big piece of writing, when it’s only a model sample and it’s a lot of language and we prefer to work collaboratively and sit in a room and talk through these issues,” he said. The public meeting later that night was one of the requirements before the Planning Commission takes a vote on Laundré’s change-of-use to a full-service restaurant that would allow it to obtain the beer and wine license. Papadopoulos and others from the group did not attend that meeting. The MOU is not part of the city’s formal planning process and it is unclear what role it serves. A city planner, who asked not to be identified, said it was a way for community groups to protect the neighborhood. Other Mission establishments said they have had similar encounters with Papadopoulos and United to Save the Mission. One MOU shared with Mission Local would allow a representative from “community groups” — which are not specified in the written agreement — to “ask for and receive an annual summary of gross receipts” verifying that more than half of the business was revenue derived from selling food as opposed to beer and wine. That MOU would essentially award the groups the right to look through the business’s books. It would also restrict the business from hosting private parties, and from selling its liquor license while in operation. For his part, Papadopoulos said, the organization felt a need to protect vulnerable residents. Roviello said the coalition asked that more Spanish-language signs be posted in the cafe portion of the restaurant and on Laundre’s menus. They also asked that the establishment’s appearance be more inviting: namely that Roviello change the color of her walls. Papadopoulos told Mission Local that the white walls signal a certain “exclusivity” that could deter families from entering. Papadopulos said, generally, the group also asks businesses to keep prices lower on certain items. Roviello remains confused and frustrated: “It feels like they want to oppose us, and I guess I don’t really know the reason,” she said. Some supporters at the meeting sympathized with Roviello’s situation of being caught between the clout of community groups and the needs of her business. Shawna Lee, once the owner of the Valencia Street nightclub Amnesia, understood Roviello’s predicament and offered advice. She added that, per city instruction, she notified nearly 1,200 residents about the meeting and only a handful showed up — all supporters. “We’re playing by the rule book,” she said. She and others are unclear as to how any MOUs with an outside organization are reflected in the city’s rules. Debbie Horn and Paul Miller, the owners of the Royal Cuckoo bar at Mission and Valencia streets — as well as a market on 19th Street — were also present at Tuesday night’s meeting. Horn and Miller met similar opposition from the Mission Economic Development Agency in their bid to serve beer and wine at their 19th Street market. The nonprofit’s argument was that Horn and Miller, both longtime residents of the neighborhood, would be complicit in further gentrifying it. At a 2017 community meeting concerning their license, however, the representative from MEDA found himself in the minority. Thanks for reporting on this Julian, I’m sure that meetings of this nature are the norm for mission businesses. This reinforces what I have heard from other local businesses that a shakedown culture exists within the mission – if you don’t comply by the rules that some unelected individuals dictate then they will interfere in your ability to maintain a viable business. Further investigation of this type of behavior by local interest groups would be really interesting to read. I’m sure that there are parallels in city planning & other hot topic issues that would make for interesting reading. This article did not report the derogatory comments made by one of Laundre’s team at the USM members. It is an article made to alter, confuse, redirect you from the issue and it has succeeded in part. But the fact of the matter is that I and many of our community do not want or need another booze joint. Washing machines yes. booze no. And that is part of what the owner is planning to put up. I say go do that at St. Francis Woods or in front of soon-to-be-ousted Senator Feinstein’s house off Arguello Avenue. (a side note: Remember “Arguello” was the first Mayor of this here town before the United States was a congruent country.) Or, maybe Laundre could go sell booze to the golf players at the presidio or in front of the hall of injustice at 850 Bryant, how about in font of UCSF? Why do we have to be quiet about it and just take a business that is offensive and unresponsive to our needs? The fact that the reporter has made out a little Godfather scene out of our efforts to beautify and create a healthy neighborhood in our community and that responds to the people who make the wealth in this neighborhood is offensive apart from being simply incorrect and off the mark. But if you want to play off this kind of circus I suggest you stick to fox news. Maybe you should get your own website. It think you’ve written enough comments about this. OOOr maybe Mission LOCAL should get the opinion of LOCAL leaders and LOCAL community members before writing such a one sided biased article. Maybe LOCALs wouldn’t have to defend their positions in the comment section. Sure sounds like Mafia, right? Ask the writer why he chose to portray this story in that fashion. This article was written so you would have this response without knowing the work of MEDA, United To Save the Mission, or any of our organizations. So come and get to know us, then judge for yourself. It is a shame Mission Local allowed this mediocre piece of work out of its editorial room. It is an attack piece, just like the fires that have destroyed many of our homes and the police who have shot our youth, lead by a bully real estate market that makes people behave like crack addicts. Peter Papadopoulos and MEDA are hypocrites and extortionists that pray upon small business owners. Nah bro! They are trying to keep families and long time businesses in the neighborhood. Karl, I’m sorry that your definition of small business is something that caters to gentrifiers and that is unwilling to commit to use the space for the people. Karl, people is being kicked out of their neighborhood, what do you say about that Karl? when did we lose you man?? you used to be so cool… Peace. All these gentrifying new “small business” don’t understand that they are displacing minority businesses and families. Go somewhere else! You do realize they replaced a T-Mobile story, right? Sorry it doesn’t fit into your narrative. It was a latino music store before that..
Respectfully, this storefront was vacant for 2 years after T-Mobile moved out. Laundre didn’t displace anyone…. I’m sorry, but what you’re espousing is nativism — plain and simple. Nativism — whether it comes from the right (like Trump) or the left (as you are advocating) is unAmerican and wrong. I respect your opinion, but MEDA telling a small business what to color to paint their walls is ludicrous! Laundre’s free dryer/detergent Wednesdays is a huge service to the neighborhood. Selling a glass of beer or wine to a patron while they wait doesn’t seem like the end of the world in order to help with utility bills. This space was vacant for almost 2 years. Two years! Vacant storefronts are terrible for a neighborhoods economy…as a small business owner in the mission for 6 years I know. I was thrilled to see anything finally move into the space! If records/cds weren’t a dying art form Ritmo would still be there and I would be thrilled! I’m sick of the Mission Originalist like MEDA and lower 24th street Merchants try to keep businesses from surviving and deny the neighborhood services. I 1000% agree!!! It’s unbelievable these business owners can deal with this while operating and growing their small businesses . MEDA sounds a little like the local mafia in Sicily. It might help to look at who funds Calle 24 and MEDA. That’s right, competing businesses. Who exactly asked them to represent the community? Isn’t that what elections are for? Welcome to shakedown street. People, don’t sign any contact without reading the whole thing and for something like this, getting legal review. Also, if an MOU is supposedly for the benefit of the “community”, then it should be made public, in both draft and final form. It’s the first I heard of this meeting and Mou and I live at 17th and mission. These community groups sound exactly like the literal textbook definition of extortion artists. We see you for what you are. Wow, this isn’t about local community concerns, it’s a well-orchestrated hold-up by so-called “community” organizations to try to force this business to let them look at their books, tell them what colors they can paint their walls, how they’re “allowed” to decorate… All without actually contributing anything to this business! What gives them this right?! They sound more like the mafia than a well-meaning group of concerned local citizens! I actually spend money at Laundré, and I will be contacting the owner to let her know of my support as a neighbor! These attempts to shakedown new small businesses are SO DUMB and likely illegal. Why would MEDA focus on a local business rather than the giant nasty U.S. Bank corp, Wells Fargo, or other big finance chains with Mission outposts? Likely because they know intimidation won’t work. Why aren’t they focused on expediting all affordable housing and keeping pressure on city hall so that we can finally get additional units in the Mission, along with benefits like parks and other community benefits? Sounds like MEDA is asking for a lawsuit. Oh MEDA – really? “They also asked that the establishment’s appearance be more inviting: namely that Roviello change the color of her walls.” Seriously? Are the windows too big as well? I think I’ll set up a business there and pray these clowns show up with their little MOU. They’d get nailed with a RICO suit so fast they wouldn’t know what hit them. wow, white walls signal exclusivity? that’s truly the height of absurdity. I think what is missing from this article is the understanding what is going on in the Mission Neighborhood and why these conversations are happening with business’s and development. We need to look at the displacement of small mom and pop business in the Mission and how higher end businesses which are usually investors have a negative effect. For every high end business that comes in we see a loss of two immigrant mom and pop business. The rents in area of the new business tend to go up and two are evicted. Its a ripple effect and continues. We have been following the trend closely. For those of us who have been in the Mission for a long time saw this tread on Valencia. I don’t think this article helped or the comments made here with the issue or Laundre. The Latino community has experienced an onslaught of displacement because of gentrification. 8,000 Latinos displaced from the Mission community and our small business are being pushed out also. Where is the outrage for them? Many non-profits in the area serve the Latino community and represent thousands of voices. They hear the issues directly from them. Calle 24 has reached out to over 4,000 in just the southern Mission. Organizations like Instituto Familiar de La Raza, Carecen, Causa Justa, MEDA, Homies, The Good Samaritan, Mission Housing and many more serve this community and represent their issues and needs. Many of these organizations have been here since the 60’s and 70’s. Demonizing the Latino community will continue the tension between new residents, business’s and current ones. Then you will surely have plenty of data at hand to make your case, right? If so, why then do you make nothing more than unsupported appeals to emotion? Look, man. We all see you for the extortion artists you are and look forward to a time when sunlight shines on your activities and you can no longer pull the wool over anyone’s eyes. Source? Where have you been living for the past fifteen years? Erick, thanks for your response. We take you at your word that your concerns are entirely above board. Since you have nothing to hide, you can post publicly the MOU that you want Laundre to sign. Please put the link here. Thanks. The MOU is with United to Save the Mission and not Calle 24 or MEDA. We are a member of United to Save the Mission. It has 14 organizations under it. I was at the meeting and the conversation was on-going with them and nothing was set. Its unfortunate how this was written and the response from some readers. I notice that you don’t say you don’t have a copy of the MOU; you just say that the MOU was with a different organization, of which your organization is a member. Do you or don’t you have a copy of the MOU? If you do, please post it or explain why it shouldn’t see the light of day. If you don’t have it, as a member of United to Save the Mission, I bet that Calle 24 can request a copy and post it, so the community can see for it self how above-board your activities are. Am I right? If so, why haven’t you done so? You say that “Its unfortunate how this was written and the response from some readers.” This is your chance to correct the record. If you don’t take this chance to correct the record, we can only conclude that the record as established by the story was correct. Your organization claims to represent the community. The community is here, on this Web site, demanding answers and information. If you truly represent the community, you will provide answers to the questions we are asking. There is no completed MOU with Laundre and we don’t have anything. Thats why the meeting was held with the owner to work on one based on the conversation. It’s unfortunate. But, no wonder you cannot find the MOU. Eric, why do you make this about race? I’m sure the fear of being labeled a racist keeps some MEDA / Calle 24 critics at bay, … maybe build the argument around economic fairness and class, not race. Unfortunately economics is tied to race and our numbers show who is having the most negative impacts. I understand what you are saying. 10,000 displaced from the Mission and 8,ooo are Latinos. It’s a hard reality. Latinos with a family of 4 in the Mission makes around 43k a year. People of color are not able to compete under those circumstances. In order for us to survive we need to discuss that reality so we could move forward. I understand its had for some folks to understand that. Thank you for asking. Erick, the ML website won’t let me reply above so I’ll ask my question here. What do you, personally, think Laundre should agree to as part of an MOU to receive support from community groups? Surely you have an opinion on this. To be 100% fair, I’ll share my opinion: nothing. Community groups should already support Laundre as a good business and a good member of the community. They shouldn’t demand anything else as a condition of their support. I’ve showed you mine. What’s yours? If you refuse to answer this question, it’s because you don’t want the public to know your opinion. For my part, I don’t want another liquor dispenser. We do need a laundromat, not a laundromat without wine, beer, booze. enough. Go try open one of these in St. Francis Woods, see how fast they kick you out whatever color walls. You’re doing it wrong. Overbearing. Patronizing. Get some impartial advice from someone qualified to help you. Then try again. You’re failing hard, galvanizing negativeness towards your cause, by the way you’re doing it. Who elected you? It’s time the neighbors started calling bulls#it on the “community” groups in the city. Cities change. It’s a good thing. Mom and Pop? 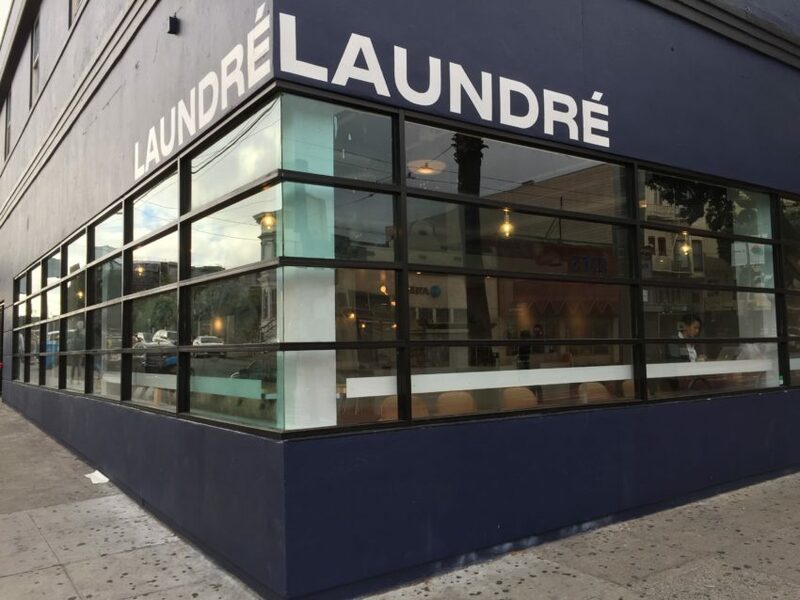 The previous tenant at 20th and Mission was a T-Mobile store… Laundre is a local business, built from the ground up and run by a female owner, with a Brazilian background. What are you talking about? Not talking about Laundre but the larger picture of whats happening in our community. Yes and before T-mobil that was Ritmo Latino. “It feels like they want to oppose us, and I guess I don’t really know the reason,” she said. I do. You’re not “in” with their clique. Extortion (also called shakedown, outwrestling and exaction) is a criminal offense of obtaining money, property, or services from an individual or institution, through coercion. It is sometimes euphemistically referred to as a “protection racket” since the racketeers often phrase their demands as payment for “protection” from (real or hypothetical) threats from unspecified other parties; though often, and almost always, such “protection” is simply abstinence of harm from the same party, and such is implied in the “protection” offer. Extortion is commonly practiced by organized crime groups. The actual obtainment of money or property is not required to commit the offense. Peter and Erick, if you are reading this, be very careful where you take this. You do not own this neighborhood, and you cannot bully businesses. We will show up to support local businesses that you extort and threaten. Great way to leverage your fake victimhood. Armory Love. – We support businesses being successful – so bring on your business for Laundre and others. The article misses our view that Laundre is not the enemy. They have done a good job for the community in the laundry portion of their business and many of us go there. But the the Mission has an Alcohol SUD because of historical problems and new alcohol permits are always scrutinized for impacts in this district. That’s why the city set up the SUD. We are just part of the process of balancing negative impacts with equity outcomes – looking for a balance that is a win win solution. What a pathetic article. As if it is okay for a cafe to be afraid of the community organizations in the neightborhood that it seeks to serve. Firstly, alcohol is not principally permitted at the location and the business owners are asking for a special favor i.e a conditional use permit. And one in a neighborhood that is already oversupplied with drinking establishments and avocado toast. These kinds of community MOUs are common and cities and communities all over the United Statesregularly sign them. It’s not extortion” to ask that new projects offer equitable access for working-class people and Latinos in a historically Latino neighborhood. United to Save the Mission has signed numerous MOUs with businesses and developers in the community including the very successful large-scale agreement at Impact Hub on Mission St. Stop writing silly hit pieces and cover what is really happening in the Mission: that the neighborhood has already lost 8,000 Latinos and is considered a national story for its size of displacement and the neighborhood is converting from a family-friendly place to more a party zone for tourists, and city officials are rightly concerned about this. I really expect better from Mission Local. Please try to do better. If the action of the “community groups” was not suspicious, why haven’t they shared the proposed MOU? Sunlight is the best disinfectant. An MOU is usually written near the end of the discussions and negotiations. This article was written at a time where it is premature to have an MOU done, so of course it can’t be shared now – it likely isn’t done. Also some businesses prefer to not share their MOU and we respect that. Some prefer to reflect their things they have learned in the process and agreed with us in positive signage or on their website advertising in ways that enhance their business image with the community. A few less immature one-sided articles that feed haters would help too. Mission Locat has mostly been a decent balanced publication. Twitter is the place for click bait articles. Can you define more precisely what you mean by “gentrifiercide”? It sounds as if you’re advocating violence against human beings. It’s perfectly clear from the article that an MOU was presented to the owner of Laundre and Papadapolous does not deny it. The MOU was apparently “done” enough to be presented for signature to the owner, but not done enough to stand up to any kind of meaningful scrutiny. The strong arm tactics and lack of transparency exposed by this article are truly alarming. This is one of the most balanced articles I’ve read from Mission Local, which is to say, it was reporting, rather than bias. You’re mistaking Mr. Mark relating facts and reporting on someone’s thoughts or feelings to be his own bias, which it is not. He’s simply giving you the facts of his reporting, from the business owner and from Mr. Papadopolous. I’m really glad that Mr. Mark lets us know what’s going on, and lets us all come to our own conclusions. You feel that MEDA, Calle 24, and other of this 14-organization cabal have been misrepresented, but perhaps you don’t understand that it’s not that they’re being unfairly villainized, it’s that many of us don’t agree with their race-based strong-arming of local businesses. Leave this business alone, live and let live! If you don’t like places that have the audacity to serve people coffee in a room with white walls, simply don’t go there! Not every business has to cater specifically to you. As a person who lives in a wheelchair, I don’t go up and down Mission Street trying to force local businesses to be wheelchair-accessible, even though many of them are not. Many of them are breaking the law, aka the ADA, but I’m not going to hassle these mom and pops, I’ll simply take my business somewhere else. Is their lack of accessibility a clear example of discrimination? Yes. One of the reasons I love Laundre is that they have a fully accessible space, including the laundromat area. That means a lot to a person like me. Trust me when I say you have NO IDEA what true discrimination is until you go through life not being able to enter most spaces or find a bathroom you can use. Why doesn’t Laundre share it? The article said they didn’t get to keep a copy. Per the article, the extortionists waived the MOU about but refused to leave a copy for Laundre to keep. The MOU that day was a sample. it was not an MOU to leave there because it did not contain the language specific to the laundromat. The article sure presents an “extortionist” scenario. It’s called Fox News Info-tainment reporting or “hit pieace.” Not meant to inform but to alter and foment intrigue, distrust and infighting. It is very common and used regularly to divide working people while the rich rip us off. For my part I definitely don’t want another liquor store, whether the front is washing machines, hardware store, flower shop or whatever. We have enough liquor dispensers. How can you decry one sided hack job while refusing to share the MOU? Your silence and deflection is what truly speaks volumes here. MEDA is just one of the member organizations, businesses and individuals working with the city to mitigate the gentrification impacts in the Mission. The Cultural Action Network supports the work of the city, the community and USM in mitigating the cultural devastation of the Mission. We support similar efforts in SOMA, and other communities targeted by rich gentrifiers. Equity must be the first priority in these communities. Most community agreements actually benefit the businesses by bringing in long time community members as customers. The process educates businesses about the community and assists them in integrating. It’s not about extracting money – it about agreeing to local hire opportunities, some offerings at prices that locals can afford, some bi-lingual signage that more members of the local culture can understand – reasonable thing to ask by a community under attack. I understand that the libertarian, tech, gentrifier culture will not understand this and some will be haters. But Mission Local generally understands the struggles in the Mission. Julian Mark must be new. i hope his work will allow him to learn too. I am glad to hear that your efforts were entirely above board and that you are beyond reproach. Because that is so, I know you will not hesitate for even a second to post the proposed MOU so that the community can judge for itself. I will look forward to reading it from the link on this webpage. Okay, if you won’t share the MOU, let me ask this question a different way. No, it’s because I’m tired of you incessant trolling and need to have the last word. sforick proves my point below. They will take any excuse not to reveal their true selves. Do you know how ridiculous that sounds? Who else are they are going to hire but locals? Is there some epidemic of laundromats importing workers from outside the city that we don’t know about? And how exactly are you going to get a new business with a brand new lease to lower the prices? They still have to make a living. There is no way any business paying for a new market-rate lease is going to be offering products/services at prices that the community that has been there fore decades and has rent-control can afford. It’s just economics 101. My lord. That sounds like you’re lamenting the fact that his article isn’t a one-sided piece of propaganda, like some of the other articles published by Mission Local. I applaud Mr. Mark for writing the facts, giving voices to both the owner of Laundre AND Mr. Papadopolous. Would you have preferred that they only give space to members of the USM? Because that’s what your critique sounds like. No matter how much you try to spin what is happening here, it isn’t right to come in and bully a business owner into letting you run their business your way. Thank you for this report. The music is also something I have routinely noticed as feeling particularly white and “of a certain class and age.” It would be great if Laundré would play at least some* Latin music. It’s an incredibly white place all around. I applaud those seeking common sense cultural humility agreements for those taking space in a historically Latin American and working class neighborhood. It’s the least they can do. I don’t think you frequent Laundre often, if at all. The very first time I went there, they were playing “Quizas Quizas Quizas”. Most evenings, they’re playing old mowtown or r&b. The clientele is racially diverse, as are the staff. The walls are white, which makes it feel clean, bright, and inviting. The coffee is competitively priced for the neighborhood. The service is friendly and polite. The space is wheelchair-accessible. What more should a business really provide?? Thank you for this report. The music they blast is also very white and noticeably of a certain class and age. It would be great if Laundré would play at least some* Latin music. I applaud those seeking common sense cultural humility agreements for those taking space in a historically Latin American and working class neighborhood. It’s the least they can do. Respectfully, it is no ones right to dictate the type of music played or color of paint on the walls of any business. Since when did clean white walls in a cleaning establishment (laundromat) scream anti-latino? Not to mention, all my latino friends listen to indie music. If you have beef with Laundre lets please keep the complaints substantial, not petty. I am deeply saddened by the tone of this article. Is not only biased but I can also see many, many similar comments from “different” anonymous people, while the people defending the mission are posting their names and are easy to identify. United to Save the Mission from the beginning has been an open coalition of MANY organization, with PUBLIC hearing and TRANSPARENT procedures to anyone interested in the neighborhood, that is THE LONG TIME RESIDENTS, ORGANIZATIONS, AND INSTITUTIONS that make the Mission “like, so cute, and actually not gross” for all the people wanting to move in, and in desperate need of a café/bar with $10 avocado toasts. DJ—you’re right, I forgot the Polish. Sorry, Polish people! Learn your history about each. Mexicans and Central Americans, Middle Eastern working class and the Native Americans all were pushed out and continue to be through redlining, racism, gentrification and disinvestment. Irish, Italians and Polish left for a better life because of the GI bill and mass production of housing by the federal government in the Sunset and east bay. That benefit was not given to the Mexicans or Blacks even though they fought in the war. The battle continues today. The Irish and Italians were late comers and they left with the GI bill after WWII and Vietnam, once they got their $$$ support as veterans, first thing they did was move to the Sunset, Excelsior, Vallejo, Pleasant Hill and that includes the Nicaraguans, Salvadorans who came in the 40’s and 50’s to build ships, run 18 wheelers, serve in hotels and restaurants and even the Mexican families who, upon having some money moved to “a better part of town.” because since the invasion of the body snatchers (Sheffield, freemont, and other murders – may they rest in peace) and the bloody genocide against Ohlones, Mestiz@s peoples the Mission District has been a landing place, where many stayed a bit and then moved out. That was in fact a big mistake of latinos, they fell into the idea that the Mission was “the poor” neighborhood and that “moving up” meant “moving out.” With the Chicano Movement came the idea of Beautifying the neighborhood and sticking around, but unfortunately a little too late. Then in the 8-‘s 90’s to today as the latino elderly die their children did not stay here, they went to santa cruz and watsonville, New York, Walnut Creek, other cities and they are selling their parents’ homes. Luckily MEDA has been counter acting that move and helping people buy and also purchasing buildings and territory in order to make housing for families. I did not hear any outcry from the community as all the lesbian businesses and community were forced out of this neighborhood by rising rents. All the local gay/queer bars and spaces are gone from the Mission, including the only Latinx LGBTQ+ bar. I didn’t hear any of the neighborhood organizations protesting that. Clearly MEDA, the USM, etc. don’t care about ALL economic displacement, and that’s unfortunate. Exactly!! I hope MEDA gave Wildhawk, a freaking marina transplant bar, hell when they took over the Lexington, but I doubt they gave a sh*t…. You do realize that the owners of the Lexington sold their bar (and liquor license) for a substantial sum to the Plumpjack Group who created Wildhawk — and they were extremely happy to do so as patronage at the bar had fallen off considerably over the years. Yes, I know what happened with the sale of the Lex. I was long-time patron, and kissed my very first girlfriend there ages ago. The patronage fell off at the Lex because most of the local lesbian/queer female community moved to Oakland, especially around Lake Merritt as prices rose on rents and real estate. As I said, the queer female population in this neighborhood was forced out by economics as well. And pretty much all the gay bars shuttered, too. I believe the last to go from the Inner Mission was Truck? Now we’re fighting to keep open the gay bars in SoMa (since you apparently have your pulse on the LGBTQ+ nightclub scene, you’re surely aware of the efforts with keeping open The Stud?). The local Mission neighborhood associations haven’t shown any interest in lending a helping hand to the parts of the LGBTQ+ community that used to live here. Guess you missed the fundraiser at Esta Noche that was standing room only and was out into the street to raise funds to keep them and the fight that continued afterwards to keep the sign. Yes, I didn’t attend that fundraiser because I’m in a wheelchair, which makes crowded bars a no-go for me. I DID however donate to the cause, and was very concerned at the time. I don’t recall there being an outcry from local neighborhood groups, other than the LGBTQ community. I was there and many from the Mission organizations where there. Latinos are also gay who are born in the Mission who are part of many of the Mission organizations. Clearly a one sided article. Plenty of us long time mission residents are not in support of Laundre. It’s so unwelcoming to this community, not just it’s white walls, it’s music and it’s whole atmosphere. We have had enough of business who come in and act like they shouldn’t care about the whole community – both the new residents and previous residents. Some of those businesses like Local Corner haven’t survived. If Laundre wants to be here long term they have to find that balance. How sad it is that you demand that everyone play the music you want and decorate their businesses the way you want. Do you enjoy living such a constrained life? Those of us without such small minds can enjoy the great variety that the world has to offer: businesses with white walls, brown walls, red walls, and every color in between. I am sorry that you are somehow offended by white walls (don’t go to Taxco de Alarcón, you’d hate it, everything is painted white, https://i.imgur.com/p0waZFC.jpg) but thank goodness we do not all have to live in your narrow, intolerant world. Try going to Sea Cliff or Jackson heights and open up a liquor laundromat and see how fast they shut you down entirely. Your being misguided by that weapon distraction that was that media “hit piece.” the issue here is this lady wants to sell booze. The color scheme and decoration is something any business association is going discuss with any business that tries to open up shop in any district. The issue here is we don’t want another booze joint, whether it has washing machines, records, flowers, hammers or any other front. We have enough liquor here. If Laundré doesn’t serve the community it won’t be successful. There are many long time residents of the mission who may like white walls… how about let the actual community decide what businesses should survive by patronizing (or not) those businesses, rather than strangling out the ones that don’t fit MEDA’s narrow idea of who belongs – like they tried to do with Royal Cuckoo. I’ve been here 40 years. I remember Ritmo Latino… I had no interest in that shop. But I didn’t go in there and try to redecorate it to my taste and tell them how I wanted them to run their business, or that they couldn’t blast Latin music out the door. And Ritmo Latino didn’t close because of gentrifiers. Valencia also used to be filled with a whole row of appliance shops and empty storefronts. Preferable? There are already cheap laundry mats with non-white walls, Latin music and signs in Spanish. In fact – if MEDA is going to shape this argument on Latino vs Gentrifier grounds, I would say that there are a ton of “Latino style laundry-mats” and none that are culturally sensitive to the original Irish residents and thousands of other non-Latino mission residents. But would it kill you to be a little bit accepting of others’ cultural preferences and aesthetics? I don’t have a problem sitting in a papuseria and listening to Latin music while I eat. And there is no shortage of that. Surely “the community” can broaden their horizons and sit in a room with white walls and listen to another culture’s music for a few minutes. Embrace diversity! That’s a fundamental San Francisco values, no? Maybe grow to see the beauty and calming simplicity in white walls…. or the benefit of letting the sun shine in through large windows? You never know what might happen if you open your heart and mind to accept all cultures and walks of life and learn to appreciate others’ aesthetic sensibilities. Laundré is a new woman-owned independent business trying to make it in a competitive market. Let them be. The problem here is a “hit piece” written in the manner it was in order to craze everyone out with its cheap little “godfather-type” scene. i can almost see the smoke filled room and the southern Italian-American accent as I read the piece. I know MEDA and the work that has supported thousands of families just like the lady that is building up this laundromat. Where she is going to hit a wall is with the liquor store idea, or bar or wash and drink or whatever. We don’t need anymore alcohol delivery fronts. Why not go sell liquor in Jackson Heights. Try to open a wash and drink store there and see how fast they run her out of the neighborhood. But somehow because we are the mission we are supposed put up with more poisoning of our community. So I don’t wash clothes here , the place turns me off big time by its sterile facade .And once last year i struck up a conversation with another pedestrian about what a cold looking place and how it turned me off. . He agreed but suddenly a young hipster/ millenial started yelling at me : ‘ what is wrong with you ? they are really nice people who run this place ‘. I am no one special or important t but I have been evicted twice : Ellis act and owner -move -in , and forced out of my small business space . So that is one human , three displacements .My take on United to Save the Missipn , Meda , etc.. Thank you ! Please fight like hell to preserve any part of Mission / San Francisco culture which remains intact ..
Susan – I’m sorry to hear of your experiences with eviction. Most Ellis Act evictions come about because of rent control, where the tenants’ rents are so far below market rates – sometimes 10x below market rates, which makes Ellis a profitable option for unscrupulous investors. SF’s hugely obstructionist planning / building dept, and groups opposing the construction of new housing have made the older housing stock a very compelling (and often the only viable) option for people who want to buy properties. What obstructionist organizations such as MEDA often overlook is that if there is a shortage of market rate housing, people who want to buy a home will more often choose to evict an existing resident (yes, even a progressive will do it… though will feel damn guilty) because it’s the only way they can afford to own a home. A sad state of affairs, but one of our own making because (1) rent control is not needs based or government funded and (2) SF govt and local organizations oppose new building projects to the point where they have created a housing shortgarlge of epic proportions. Over crowding a small city is a recipe for disaster. The traffic is absolutely disgusting and dangerous. Building more homes is not the answer. Raising the rent is not the answer. What has caused an imbalance in SF. is Tech money, those who do not work in those industries can not compare in annual salary. We need to acknowledge this. Building more wont fix wealth inequality. For people who work in Hospitals, Schools, Non Profits they are being forced out of a city where they have lived and worked for decades. I personally feel that Tech communities and gentrification has actually not contributed to SF in a balanced way. When families can no longer afford to live in a city together, where their parents raised them shoes how harmful gentrification is too healthy families and communities. Wealth inequality is destroying the middle class & keeping people in poverty. The problem is gentrification is greed,selfishness Gentrification does not taken into account history and culture or wealth inequities. How is that in the Tech hub of the world SF does not benefit in Tech innovation. Tech Companies build building in their honor, but how much does it actually contribute to a better San Francisco. How is it that Tech innovation has not help us solve our homelessness problem, or contributed to the advancement of math and science in public schools in SF? Where is the Tech community in offering after school jobs to our youth or offering free tutoring in coding for our kids? How has it that Tech innovation and gentrification has not solve our transportation issue or traffic congestion? How is it that Tech innovation has not helped our hospitals or law enforcement to be more effective? Gentrification caused by tech communities have a responsibility to contribute in a healthy balance way than just be takers and demand space for themselves. Displacing people who have given their lives and families to a city for generations. Is unconscionable. The fact that people see Tech community as selfish and greedy shows that the Tech community lack humanity. I hope that The Laundre can thrive and be successful and I hope La Mission can still thrive & be healthy and happy. I love the Mission. I miss the local stores and grocery stores I hope everyone can come to a better balance. I know everyone loves alcohol but what else can help a laundry business stay afloat than alcohol in a community that is flushed in alcohol already. C) now you just figure out you need an additional revenue stream? I would have had this all sorted out and made sure the liscencing was there and I would be allowed to sell beer and wine in an already labeled densely liscenced area BEFORE opening a business on such a model of scarcity because that is the reality of the neighborhood. Don’t get me wrong… I support women and minorities in business but I am lucky and get to spend 2 to 3 months a year back in my neighborhood and these businesses are changing over faster than I change scarves… just my personal observation. I wish you luck on your endeavors… and as for the rest of you long termers HANG IN THERE!!! we still need that diversity that makes the Mission what it is and not so damn sterile. At a time when the Mission gentrification crisis is getting national and international coverage and that readership is grieving for us, it is shameful that this what is presented in our own neighborhood. No mention was given to the process of stabilization of our beloved community being done through traditional MOU agreements, education, legislation, harm reduction and support for those suffering the trauma fo this crisis without their voices being heard. We see no input from partnering business owners, developers and residents. No mention of the successful outcomes, partnerships and strong connections made. No background about the hard subjects being discussed at the table, the process and why this model is being utilized in other neighborhoods in the city, bay area and around the country as other communities work together to prevent harms and the displacement that they have seen us experience. Over 10,000 residents and business owners have been displaced in our community; 8,000 of those displaced being Latinos. Now is not the time for fragility. Every single member of this community needs to find their courage to accept that each of us plays a role in gentrification. Each needs to find the courage and openness to gain a deeper understanding of how gentrification works, how we can prevent direct/indirect harm, and strengthen and heal our community. We rise together. One of the fortunes of our community is that we hold a person in particular that is arguably on of this city’s finest journalists, best experienced, with the breadth to fully delve into the coverage that this crisis deserves. He works in an office in the MEDA building, in the middle of ground zero. Joe, we need you to cover this crisis. You’re not only one of the extortionists, but you’re evidently also “drinking the Kool-Aid”. And Julian Mark did a fine job of reporting the disturbing facts of the situation, you simply didn’t like the way it made you look and how it exposed the corrupt nature of your activities. Its quite remarkable that Mission Local — especially since, as you aptly point out it is a tenant within a MEDA-owned building — was willing to publish this article, tell truth to power and risk MEDA’s ire. Furthermore, it’s rather disturbing how you are now appealing to one of Mr. Mark’s colleagues, Joe Eskenazi, to step in and spin it in your favor. Wow – the article is definitely lopsided and noting the anger of so many commenting. And noting the trolls. The Mission has a Special Use District for alcohol for so many good reasons. It has the highest concentration of liquor outlets in the City and MANY local residents and community groups worked to bring create the SUD. Mission Local has covered this on many occasions. From the article it sounds as if Laundre is now relying on selling beer and wine to keep the laundry services affordable? Was that an afterthought or a planned approach? That wouldn’t be a good start for a viable business plan. Back to the article – please add context and perspective including the impact of new businesses on local mom and pop shops and who they’re catering to. Thank you United to Save the Mission for representing the voices of the wider community that continues to be negatively impacted by speculation and gentrification. Right. Anyone who is indignant at the injustice which is being inflicted on the owners of Laundre is a “troll”. USM is not opposing the liquor license… they’re only threatening to oppose the application unless Laundré does what they want. That’s what people are upset about and why so many see this as extortionist. MEDA es un grupo abusivo y no representa a la mayoria de la comunidad Latina. Su interes unicamente es mantener poder y los beneficios que viene con sus amenazas. Nadie los han elejido. El pueblo tiene que reconocer que hacen daño a nuestra economia. There are errors in your Spanish. Should be “los beneficios que vienen”: plural noun requires plural verb. Similarly, should be “Nadie los ha elejido: nadie is singular. Nice try, though! Por mas de 25 años he conocido a los equipos de MEDA y he visto como se han beneficiado nuestras familias abriendo pequeños negocias de jardinería, construcción, bienes raíces, declaración de impuestos. He visto a nuestros hijos e hijas beneficiarse de la educación y las artes gracias a MEDA, se han salvado hogares. Lo he visto – no me lo contaron. El problema aquí es el artículo erróneo y falso que escribió el periodista, sembrando duda, creando intriga, fomentando división entre nosotros mismos para que entre el rico mientras nosotros no peleamos. MEDA funciona y es una de nuestras instituciones buenas. Pero este artícluo me hace dudar de Mission Local, una pequeña institución que siempre me ha gustado por su reportaje honesto, parece que se les fue de las manos el falso reporte que aparece aquí. 1. Great establishments have signed an MOU with USM – Kitava (16th & Mission) and Impact Hub (15th & Mission) are two examples – Kitava could have been a white hipster haven, but instead its a beautiful example of what an inclusive, diverse San Francisco restaurant can look like inside – both amongst the clientele, and the staff. 2. From what I know USM members, they want to be collaborative with everyone and help the Mission grow while allowing the Latino culture and community to flourish. When ever I have asked questions as a naive newcomer, they have taken time to explain important history, and why they do what the do. These individuals have interviewed business owners that failed and also new business owners in my building, putting in many volunteer hours to help businesses be more effective with their profits while helping the Latino culture flourish and enhance the Mission. 3. The MOU framework promotes inclusivity to bring the long-term Mission residents closer together with the newer population of the Mission. I think many San Franciscans would agree that racial and socioeconomic diversity, and a mix of new residents and older residents in our neighborhoods is a good thing for everyone. When neighborhoods mix, I believe it’s important to pay special attention to helping enhance the traditional culture of the neighborhood and do our best support low income groups. About “sharing the MOU” – I understand that each MOU is different because businesses have different goods and services, goals, size, etc, which is why there is no MOU with Laundre yet. I do agree that sharing the MOU framework with everyone would be enlightening. Let’s embrace our community, and keep listening and learning. I look forward to reading MEDA’s interior design guidelines, complete with pre-approved color palette. And Calle 24’s required music playlist. Honestly, they sound like the worst, nit-picking HOA. Thank the reporter of the “hit piece,” for that fantasy story you read. It sure does sound like a scene from the Godfather doesn’t it. Goes to show even a reputable organization like Mission Local will miss a propaganda piece every once in a while. If you knew MEDA and United to Save the Mission you would be very offended by this hit piece. Actually they have some very good and creative people who would do a great job of interior design for some of these businesses, but of course the city officials are doing the best they can to blight out the mission and kick out al the “indians,” as they try to create fort larramie. and if you make under 120k per year you could be on the kick out list to my friend and the night fog horn would be out of town. – They think Latinos have some God-given right to stay in Mission and to keep non-Latinos out. – When non-Latinos move to Mission, they cry “gentrification”. Later, when non-Latinos leave Mission, they’ll undoubtedly cry “white flight”. Yep, it’s always whitey’s fault. Local residents in any lower income community have the right to defend against the forces of gentrification. Up here, the Mission is the center of organized pressures to gentrify out the people and the culture. Similarly in LA Boyle Heights is defending it’s residents. the fight goes on. You can be all YIMBY on us and belittle our efforts, but you need to do better. Help us find a way to allow paced growth including new residents while protecting the vulnerable. Start by voting Yes on Prop 10 and Prop C.
“8,000 Latinos displaced from the Mission” is oft quoted but never cited. The Census tracks changes in racial composition but it does not the reason why it changes; somehow all this change is attributed to affordability. Latinos also left the Mission because of failing schools, rampant drug dealing and prostitution, a gang crime epidemic among others. Rather than focusing on window sizes and the color of walls in wine bars, MEDA could be working towards meaningful change to to improve the lives of Mission residents. But of course then there’s no money in it for them. Please research before you accuse and state rumors and opinions as fact. The subject of the article made it sound like this was about MEDA – wrong. MEDA and Calle24 are only 2 of the member organizations of United to Save the Mission. Our members are mostly non-profits that are doing great work to improve the lives of Mission residents – that’s where most of their money goes! Thanks for reminding us all that it’s not just MEDA but other fringe groups that claim to speak for ‘the community’ are also engaging in extortion. While we’re clearing up rumors and opinions, perhaps you can tell us where this ‘8,000 Latinos displaced from the Mission’ statistic comes from? The City has studied. Also CCHO/MEDA studied. Is this a serious question from someone living under a rock or just more attempts to create noise and doubts about known facts? Who else does that? The number comes from the city and the only extortion going on here is the ugly building known as “vida,” telling balancoir, across the street (now a sports bar) we don’t want you serving mexicans and blacks. I passed three laundromats today on 23rd street that have white paint on the interior. To whom should I report these discriminatory businesses? You have no idea what gentrification is. You have no idea what sarcasm is. Can MEDA approach them on my behalf? It makes me super uncomfortable. Funny, so if a place that is opened by somebody who has a good taste is suddenly gentrification and , as mentioned by somebody, huge banks and all, are just fine? Chains, etc are the problem, because they will always outbid small business owners. Laundre is a small business. Should the owner really be sorry her place is not a taco shop? really?The group sounds like mafia. Disgusting. I worked for Laundre for a while and I can tell you, the owner would work 2 months straight, without a single day off, her dad helping with construction/fixing and so on and on. Still not true” small” business for the group? I hope they will be shamed very very soon. the group sounds like the mafia because the reporter wrote it in that fashion. This type of writing is called a “hit piece” for that reason, to confuse people and have them feel “disgusted,” by the story, when in fact we are those very hard working people like the owner and her dad. We are the ones pushing for small businesses to thrive and they thrive by having a laundromat that is responsive to the community that surrounds it and that is Spanish Speaking hard working people who need to wash their clothes and don’t need a liquor store inside the laundromat. Plus she could never have a taco shop, it would fail. stick to laundromat not liquor store. But, you see, the article is to get us the working people to fight each other, based on misconceptions and intrigue instead of working together as working people who work from 5 am to 6pm as I do. Why would her taco shop fail? This isn’t a blog read by people who were born and raised in the Mission. They aren’t going to see any of your comments. They aren’t going to see just how naive and oblivious the writer and most of these commenters are. The locals are making many of the same mistakes the native americans did when they first welcomed the Spanish. This negotiation will always leave them with loss. Fighting over signage and color is a sign that they don’t understand that there is only one way to stop this, money. The gentrifiers just see the neighborhood as a cheap opportunity. @Ash, where will the money come from? Yup, They do see us that way, when they even see us. That is why a good boycott that is effective and well organized teaches them respect. It is really too bad this hit piece against Peter P. was published. It confuses the community and misrepresents MEDA, United to Save the Mission (USM), which is precisely made up of members of the Mission community, who have lived here for decades. I have lived in this community for over 30 years and remember very clearly all the efforts we have made to stop the indiscriminate flow of liquor, wine, beer through our neighborhoods; decades protecting our children and organizing to create accessible housing for our families, when it was the most dense neighborhood in the city and “density” was a bad word among politicians and speculators. What the reporter did not report about the meeting with USM is the tone of voice in which one of Laundré’s members stated derogatory comments at the USM group. He was also not present when management of the ugly building called “vida” threatened the owner of then “Balancoir” with: “… we don’t want you serving Mexicans and Blacks….” The reporter doesn’t seem to remember the burning of the buildings on 22nd. and Mission that eliminated over 20 families’ homes, a popular shopping center and killed one man; nor the fire on 29th. and Mission that destroyed the homes of several dozen latinx families, and neighborhood restaurants; nor the fire at Rolling Stock that eliminated the houses of another six families at 16th and Shotwell St. Not to mention the killing of several of our youth by police and the curfew laws that terrorized our youth and the latest trick – the red carpet down mission street and forced right turns that have devastated local businesses forcing possible clients away. I myself have felt the sting of the bully housing and displacement market, when I have been insulted and frowned upon as an outsider by European Americans who feel uncomfortable with my presence at a local store or in front of their rental. These aggressive attacks against our families have created the need for us to reach out to local businesses to create memorandums of understandings – agreements of collaboration and good faith actions. Creating a “mystery” around a simple community-based agreement and calling us “outside groups,” is only meant to create tension and it is unfortunate this kind of “defend the alamo,” attitude is being fomented and published by Mission Local, a news agency we can still consider a news agency – not a mini fox info-tainment business. When will outside investors understand we don’t want and don’t need more alcohol in our neighborhood? We appreciate a laundromat very much. It is good to see the owner has some signage in Spanish, but she would simply get more business by being responsive to our community. She would benefit very much from responding to our “gustos” and dollars. MEDA and United to Save the Mission were born of tremendous effort and love for our neighborhood and their work emerges from the dreams and desires of working people in the mission to achieve a life of quality commensurate with the amount of wealth we produce with our work. This article is very unfair in trying to portray our organizations in this misinformed manner. Peter Papadopoulos is one of many people of conscience and good will who have seen and work to stop the devious attempts of corporations, speculators and investors who wish to push Latinos, African Americans and other working class people who make under 120k per year. We have all seen the displacement tricks – devastate local businesses, create blight, kick the “poor” people out and then start bringing in businesses that pander to “the desired customer.” This article seems to be part of that plan. We need Mission Local to continue being a clear and effective news agency and local businesses to contribute to the beauty which Mission Neighbors have cultivated in this district. No one needs another liquor store. Blessings!! If MEDA would only fight crime, trash, corruption as hard as they fight white painted interiors and badly needed housing SF would be a much better place. It really hurts to hear that MEDA is referred as a Mafia. By saying that you are discounting the good work people in that building do everyday. Do you of another organization in the Bay Area that prepares over 4,000 taxes for FREE? (this is just on their MANY free services) MEDA is not a person, is not a corporation or a mafia. MEDA is an organization comprised of 70 smart, hard working people. The people in that building are passionate about their work, they believe in creating a inclusive community and they work countless of hours to provide services to people that need it the most in this community. You are not just tarnishing the reputation of an organization but of the people (who are mostly latino and immigrants) who feel so empowered and passionate about their work. Since when is dreaming about a more inclusive and equitable neighborhood a mafia?